Home / swordpress / Kidnappers tie Ondo lecturer to tree, Machete Him Heavily and shoot him dead after ransom was paid and they coudnt find it ! Kidnappers tie Ondo lecturer to tree, Machete Him Heavily and shoot him dead after ransom was paid and they coudnt find it ! 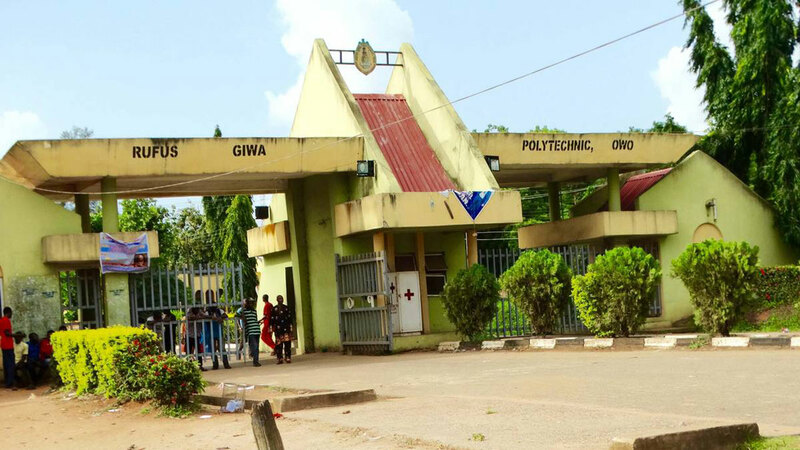 Rufus Giwa Polytechnic, OwoAcademic activities were yesterday suspended following the gruesome murder of a lecturer of the Rufus Giwa Polytechnic, Owo, Ondo State, Mr. Taiwo Akinyemi, by kidnappers. Akinyemi was abducted on Tuesday along with three others near Amurin Village along Owo-Akure Road. The killing may be due to the inability of the kidnappers to pick the N500,000 ransom where it was placed as three other victims kidnapped with Akinyemi had regained their freedom. The ransom was still intact after Akinyemi’s body was found by a farmer, suggesting that his abductors might have killed him because they could not find the money where it was dropped by the institution who negotiated his release. It was gathered that the kidnappers tied the 52-year-old lecturer to a tree and used his clothes to tie him before shooting him. The kidnappers also macheted him gruesomely. Akinyemi’s murder led to the suspension of the second semester examination scheduled to begin yesterday while students and staff of the institution moved round the school in procession as a mark of respect for the deceased. Governor Rotimi Akeredolu also suspended all official assignments and rushed to the school to commiserate with the academic community, describing the lecturer’s death as unfortunate. The body of the 52-year-old lecturer was found in a bush tied to a stick on Sunday evening after being in the den of the kidnappers for six days. Addressing journalists, chairman of the Senior Staff Association of Nigerian Polytechnic (SSANIP), RUGIPO chapter, Chris Olowolade, described the death of the father of three as sad. He explained that the union had entered into negotiation with the kidnappers in order to secure his release. “We lost him to the kidnappers and received his body yesterday. The kidnappers placed a ransom of N100 million on him, which nobody can afford but they reduced it to N7 million after two days and later grudgingly asked us to come with N500,000. The money was taken to them and the person who took the money was directed by the kidnappers to where he should drop the money. They asked him to stop, reverse and move just to confirm if he was the actual person bringing the money. “But after some hours, they called that the man bringing the money should come back that they didn’t see the money, only for the Rector to be called yesterday to come and identify a body. We rushed to the morgue and discovered it was his body. “The body was recovered by the police and deposited at the morgue, it show he was badly maltreated before he was killed. We, however, recovered the N500,000 ransom taken to them. We suspect that maybe Akinyemi died in their hands before the ransom was taken to them,” he said adding that the deceased was shot at the back by the kidnappers while he was also heavily macheted before he was killed. Addressing the institution’s community, Akeredolu explained that the state government and the security operatives tried to rescue the deceased. He gave the assurance that the government would be committed to the security of lives and property, saying he has directed the security operatives in the state to increase road patrol to curb the activities of kidnappers on the roads. The state Police Public Relations Officer, Femi Joseph, policemen are on the trail of the kidnappers but no arrest has been made. He enjoined the people to be more security conscious and report strange faces or movement to the police. Meanwhile, the Nigerian Medical Association (NMA) in the state has called on the state government to convene a security summit to address the incessant kidnap and killings in the state. The state’s NMA chairman, Dr. Olawale Oke, made the call yesterday in Akure at a press conference. The association expressed its dissatisfaction with the security situation in the state following the kidnap of a pregnant doctor and two nurses by gunmen on the Akure-Owo Road on Thursday. “It is on this note that we are crying to the whole world that those that are carrying out their legitimate duties are no longer safe in Ondo State. “We, therefore, call on the Chief Security Officer of this state, Rotimi Akeredolu, to do the needful by paying more attention to the security of lives and property of the people in the state so that law-abiding citizens can be more productive. There is an urgent need to call a real state security summit, which will address the present situation and proffer general panacea to insecurity,” he stated. In another development, the police command in Nasarawa State has confirmed the abduction of David Ayele, the All Progressives Congress (APC) candidate for Obi II constituency in the 2019 election. Kennedy Idirisu, a superintendent of police and the command`s spokesman, told journalists yesterday in Lafia, the state capital that the politician was abducted by gunmen from his Lafia residence around Tudun Kauri at about 8:00p.m. on Sunday. Idirisu said the police responded immediately the report was made by trailing the suspects and later found the victim`s car along Obi-Awe road. He said the police was working to ensure that the victim was rescued and also stem the tide of kidnapping in the state. “We have deployed our men to comb the area where the victim`s car was found and we are also gathering intelligence that would lead to the rescue of the victim,” he said. The spokesperson appealed to the public to always report suspicious movements in their areas to security agencies for prompt action. Next post: Top 10 Popular Markets in Benin City, Edo State Nigeria One may be the Oldest International Market in Nigeria !